Saltwater-dwelling red algae, a predominant type of seaweed used since 300 BC for its high-nutrient content and medicinal benefits, contains an abundance of vitamin K and calcium. Red algae supplements may help treat hypertension and provide strong antioxidant effects. However, red algae components may also result in several adverse side effects including constipation and blood clots. As with any nutritional supplement, consult your doctor before taking a red algae supplement. Red algae supplements may produce positive effects in people with hypertension. A Korean study, published in the 2006 edition of the journal “Algae,” observed the inhibitory effects of red algae extracts on an enzyme linked to high blood pressure. The angiotensin-1 converting enzyme, or ACE, plays a significant role in controlling blood pressure, according to researchers. Scientists reported that some red algae species produced “remarkable” anti-ACE activities when compared to other marine organisms. Findings suggest red algae have excellent potential for use as an ACE-like inhibitor. However, additional scientific research is needed to conclusively prove the effectiveness of red algae to treat hypertension. Based on observations of mildly hypertensive patients, Drugs.com generally recommends a daily dosage of 6 to 24g of red algae supplements. The vitamin K in red algae supplements can interfere with blood-thinning medications such as warfarin, according to Drugs.com. Vitamin K creates blood clots, or coagulates, to prevent excessive bleeding. Vitamin K works with several proteins to form clots in the blood, which can block or reduce blood flow in the heart, brain or lung arteries and cause a stroke or heart attack. Thus, taking a red algae supplement may inhibit the effectiveness of anti-coagulating medications. However, healthy individuals need an intake of 80mcg of vitamin K daily, according to the National Institutes of Health. Calcium, a main element in red algae, may potentially result in several adverse effects. Though no official dosage of red algae exists in 2011, Drugs.com generally recommends a safe dosage of 900mg of red-algae-derived calcium daily, based on research regarding seaweed effects in osteoporosis patients. However, doses of calcium in excess of the Office of Dietary Supplements recommended adult daily dosage of 1,000mg can result in digestive disturbances such as constipation, gas and bloating. In addition, though rarely occurring from calcium-containing supplements, extreme levels of calcium in the blood, or hypercalcemia, can cause kidney malfunction and kidney stones as well as hard calcium deposits in the arteries and veins. An antioxidant in red algae may provide 10 to 100 times more strength in scavenging disease-causing free radicals than most antioxidants, according to medical doctor and alternative medicine pioneer Robert Rowen. The potency of antioxidant-acting polyphenols, or plant-derived chemicals, depends on the number of interconnected rings that make up their structures. While most polyphenols have three rings, the Seanol polyphenol has up to eight. 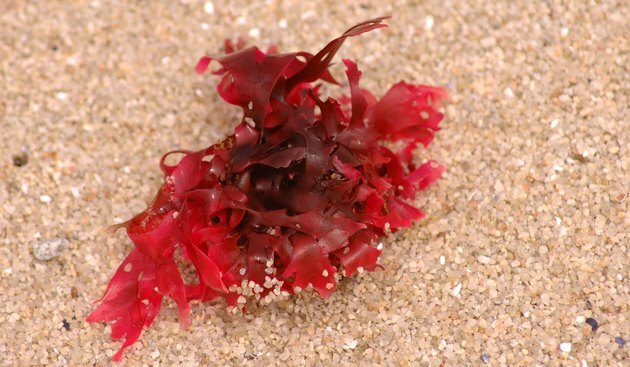 Extensive observations of this disease-fighting component of red seaweed indicate it greatly benefits heart disease, osteoporosis, diabetes, dementia and many other conditions, reports Rowen. Due to the high levels of iodine in red algae, using these supplements could result in an overdose of iodine. You could also experience gastrointestinal problems such as soft stools and a feeling of fullness. Since regular intake of red algae could interact with medications or health conditions, you should consult your doctor before beginning this or any other supplement.